Brian Hemsworth, marketing professional and author of this blog will be interviewed by Cindy Rakowitz Thursday on the Stars of PR radio show. They’ll be discussing Southern California Professional Magazine, marketing, and a whole bunch of related topics. Cindy is the CEO of Blackman Rakowitz Public Relations, and is a highly respected, award- winning executive with years of experience in crisis management, branding and marketing. Rakowitz contributes as an expert analyst to several news organizations. She is the co-author of the new book Emergency Public Relations, Crisis Management in a 3.0 World and is currently enjoying her speaking tour. The show is broadcast live at 7:00 am Pacific Time on VoiceAmerica internet radio. Click here for more info: http://www.voiceamerica.com/show/971/stars-of-pr. I am convinced of it—advertising has a brand problem. Discussion after discussion, meeting after meeting, experience after experience, it keeps coming back to me: advertising is losing the war. With big agencies, and big accounts, and big budgets, the word ‘advertising’ is still okay. But in small to mid-sized business, saying ‘advertising’ in conversation makes you sound like you’re completely out of touch with today. The CEOs, managing partners, and presidents of today’s businesses and organizations don’t like advertising. It’s been drilled into their heads that it doesn’t work, or at least a big part of it doesn’t. That can be argued, but that’s for another blog post. What can’t be argued (well) is that our terms have changed. Today’s executive is much more interested in ‘marketing’. Now the classic definition puts advertising as one activity under the marketing umbrella, but that’s beside the point. That’s not how corporate America is using the term. 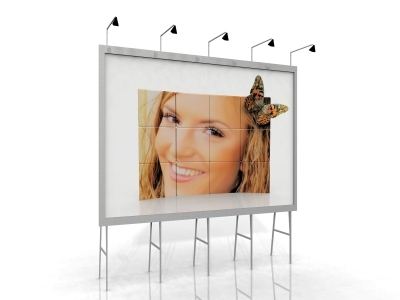 Marketing is now loosely defined as everything to promote your product or service EXCEPT advertising. It’s about social media, personal selling, networking, PR, sales promotion, trade promotion, events, and ‘engagement’. It’s not about advertising. The C-suite has been misguided, I will give you that. In the push for ‘accountability’ in marketing and advertising expenditures, traditional advertising has been pushed aside by the Internet for its incredible measurements and metrics. With the web, we know who is visiting our sites and opening our emails. When know when the did it, for how long, and where they clicked. And if a purchase action occurred, we can point our finger right to the action and know how, where and why. Tradition advertising doesn’t offer those luxuries. It’s much harder to track—not impossible, but harder. CEOs want numbers…or better put, CFOs are pushing CEOs to want numbers. Here’s the catch: just because its harder to measure doesn’t mean it isn’t working. To add to the challenges of advertising accountability, we now have to worry about the perception of the whole concept. Since the economic downturn of 2008, my students at Pepperdine University have learned that it is far easier to get ‘marketing’ jobs than ‘advertising’ jobs. And that, my friends, is a classic brand problem. Advertising and branding luminaries Stuart and Bob Sanders years ago drilled into my head that branding problems are not always (or even often) from real circumstances. They are from perceptions. And the good news is those perceptions can be altered. Hey everyone, here’s a cool new social media platform that focuses on live events. It’s in beta right now, but you can be one of the testers. It’s free, just go to Crowdseye.com and sign in. They just had a really successful test at SXSW, and are planning on the big launch for Coachella. 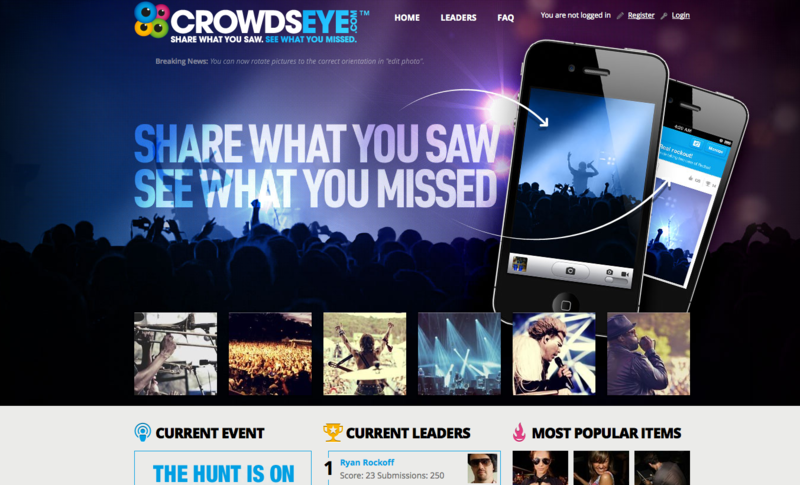 When you post pics, video or comments, you’re entered into Crowdseye.com challenges, and you can win stuff. Want to mention to all of you Southern California Professional Magazine. It’s a very new concept in online publishing. The magazine is publishing in two formats: static and flash. The static version looks like a conventional website, while the flash one looks like a printed magazine. 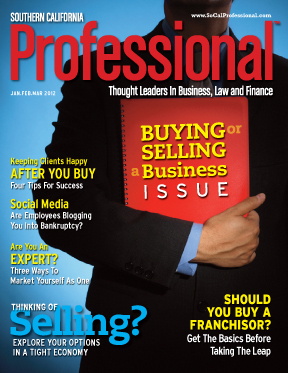 The first issue features articles from thought leaders including franchise attorney Barry Kurtz, author and sales consultant Alyse hart, business broker Matt Coletta, employment attorney Karen Gabler, iCare4Macs president David Joyce, and, well, me. The magazine will be promoted with marketing activities including press releases, Facebook, LinkedIn, Twitter, social marketing, and even an upcoming radio show appearance. 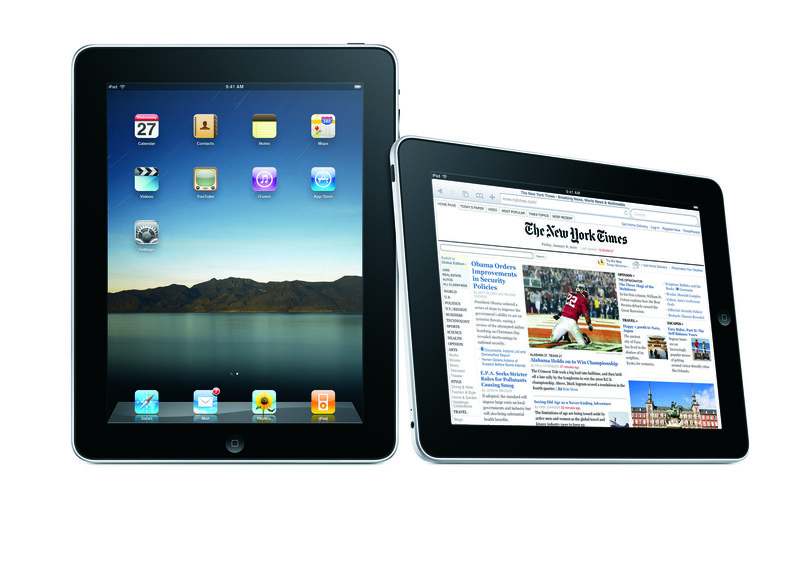 What does the Apple iPad have to do with legal marketing? A lot. That why was not a real question, but a rhetorical one. Those who didn’t “get it” simply assumed it would go away. An Apple failure. First week sales were a few hundred thousand. It took a bit longer to hit one million in sales. PC fans assumed sales would fall off after the first blush. But that didn’t happen, either. 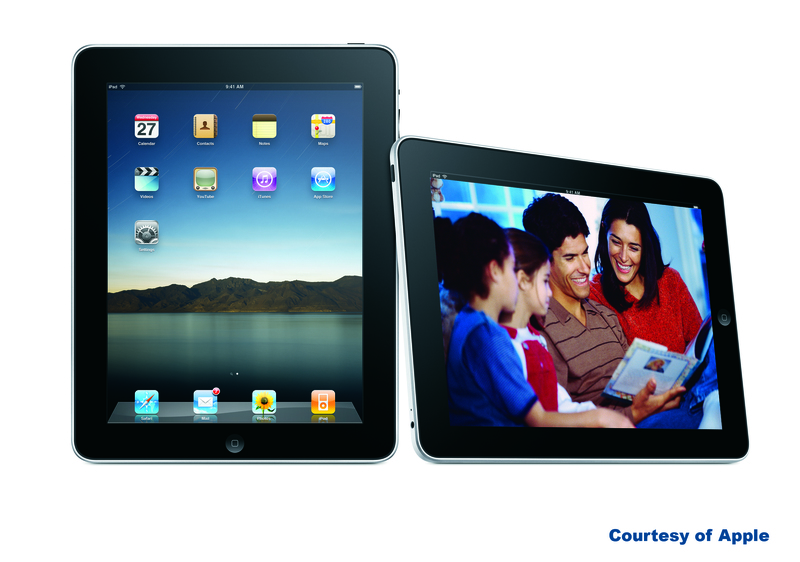 In its first 80 days, the iPad sold 3 million units. Not too shabby. Pretty sure more PC manufacturers would jump at that. As would most phone manufacturers. Or any manufacturers of anything, for that matter. Oh, and during this time, Apple also launced the new iPhone 4. As of this writing, 1.7 million in sales…in just 5 days. Not bad. What about the attorney’s and their marketing lesson? I consult with a lot of attorneys, accountants, financial professionals, and other professional service providers. The competition for lawyers is intense, and they’re diving into marketing like kids jumping in a pool on a hot summer’s day. Here’s three things I’ve learned to say when speaking on marketing to groups of lawyers. 1) Brands are built step by step over time. How you answer your phone, if you answer your phone, or what your voice mail sounds like—they’re all a part of your brand. Every experience your clients receive in working with you builds (or tears down) your brand. And it never ends. Your brand as an attorney is never done. 2) Don’t worry if everybody doesn’t “get it” right away. 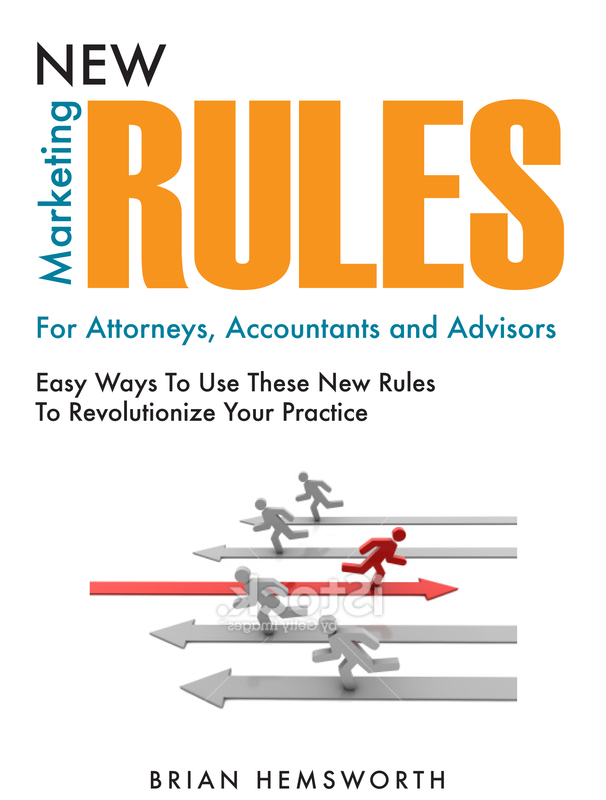 Marketing attorneys and law firms is about marketing expectations. When people don’t have the need for your services, they won’t hear much. Keep the message simple. Focus on being different, and being memorable. But when a potential client needs your services, they’re like patients in the emergency room: they want to know that there’s someone around to make things better. That’s what your brand needs to tell them, that you can help make things better. 3) First, be good at what you do. Then get people to understand what you do. Apple, in my opinion, didn’t do a great job of explaining what the iPad was for in the pre-launch marketing. Was it a tablet? A computer? A big “apps” screen? Apple’s first concern was doing their job of making a good piece of equipment that worked well. And they did that. Next came explaining it. How did Apple do that? They simply launched it. I bet their research showed that once in people’s hands, they’d love iPads. Every person I know with one was in love within five minutes of booting it up. Apple didn’t need to “sell”, they needed consumers to “experience” the iPad. Three million units later, I’d say its working. It’s been said that iPads are lousy for productivity. Why? Because as soon as you bring one to a meeting, everyone wants to play with it. I know one attorney, a big PC guy, who was into music. He determined that an iPod was the best MP3 player and got one. A while later, he decided to get an iPhone, because his Blackberry just didn’t do all he wanted. Once he got that, he decided he wanted an Apple laptop for work. And yes, when the iPad came out, he got one of those, too. PC user, to Apple evangelist in 3 months flat! “What about your phone?” I asked. Marketing will change as Internet TV takes over traditional television! In just a single decade, we can expect to spend more time watch video via computers, pads, tabs, and phones (as well as any new yet-to-be-invented devices). For many of us, this may seem inconceivable. On the other hand, if you were to ask my university students, they’re surprised it hasn’t happened already. The advertising, news, and economic impact of this will be staggering, marking a huge shift in communications. Marketing and branding will NOT be the same in the not-so-distant-future. We know officially live in a world where the consumer can choose what media they consume, and when. As my frequent readers may have heard me say before, we handed the keys of the communications car to the public, and as marketers we’ve been relegated to the backseat. Stay tuned for more strategies on getting back behind the marketing wheel and learning to drive your message in a new way!